^ Snyder, J. P., 1987. 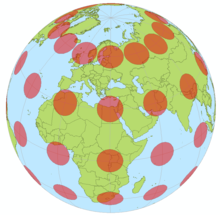 Map projections: A working manual. Geological Survey Bulletin Series. U.S. Government Printing Office. ^ Yan, Jin; Song, Xiao; Gong, Guanghong. Averaged ratio between complementary profiles for evaluating shape distortions of map projections and spherical hierarchical tessellations. Computers & Geosciences. 2016, 87: 41–55. doi:10.1016/j.cageo.2015.11.009. * 周占鳌. 新编地图学教程. 高等教育出版社. ISBN 978-7-04-007263-1.